What it doesn’t say is how much money was lost along the way. Maybe it’s asking too much of the state, but wouldn’t it be nice if the state also disclosed how much money was sucked out of each community? The Minnesota Lottery has sucked $326,119 out of this community. 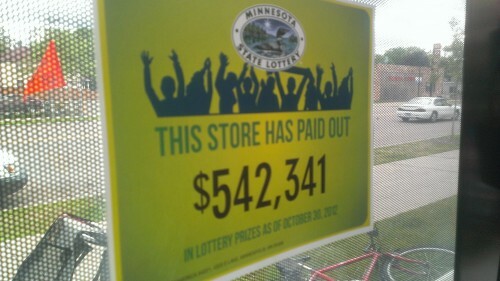 Gamblers have lost $326,119 so this store could make $51,682. Since the lottery is run by the state, shouldn’t the state have the decency to disclose the damage it’s doing on signs like this? How Much Are You Willing to Lose Per Hour to Provide Corporate #wilfare to the NFL? The state of Minnesota is off to a slow start in their effort to extract tens of millions of dollars from gamblers via e-pulltabs for the NFL’s benefit. This is partly my fault because I’m up $4.50 after the one game I played at O’Gara’s in October. There’s a name for repetitively clicking stuff on a computer: work. I prefer doing this type of work for a salary rather than Pavlovian rewards. 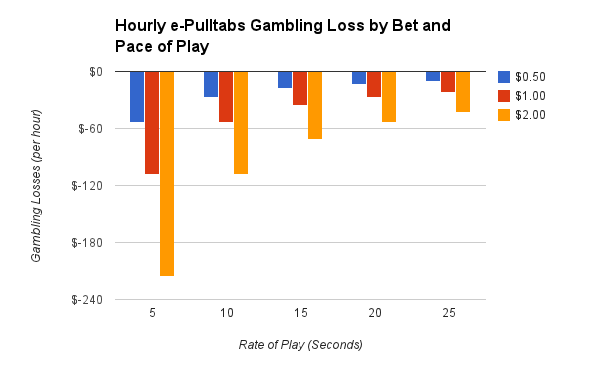 E-pulltabs have an 85% payout under current laws so an average dollar bet returns 85 cents. The majority of the other 15 cents goes to corporate Wilfare for the Vikings and the device vendor. A small fraction goes to a local charity and the bars where the games are played. If you plan to spend some time losing 15 cents per hand while drinking a beer, how much can you expect to lose? That comes down to how fast you can play. Once you’re familiar with the games, it seems reasonable that you could play a hand every 15 seconds (probably faster). At 15 seconds, you’ll lose 60 cents per minute on average or $36/hour. If your goal is to lose at least $50/hour, you have some options: $2 bets every 20 seconds will get you there. You’ll need to up your pace to 10 seconds to lose that much at $1 per hand. And, with enough focus, you could lose $50 in an hour at 50 cents per hand if you maintained a 5 seconds per hand pace (around 700 hands in an hour! Don’t forget to blink!).
. @govmarkdayton As a #vikings fan, I want to pay my fair share. Where can I find Vikings Stadium pulltabs? Let’s assume that Loren is willing to lose $100 for Zygi Wilf’s gain. At $1 per hand, it will take Loren nearly two hours to do so. Once Loren’s parted ways with his Benjamin, how much will go toward debt payments on the state’s stadium commitments? $36. Loren would need to spend two hours of his time to lose $100 in order to generate $36 in stadium financing revenue. $25 goes to the pulltab vendor. $20 to a local charity, and $15 to the bar. I don’t know how much respect Loren has for his own time and money, but there may be easier ways to give money to the state to help pay for a Vikings stadium than this. Author Ed KohlerPosted on December 6, 2012 Categories Gambling, Politics, VikingsLeave a comment on How Much Are You Willing to Lose Per Hour to Provide Corporate #wilfare to the NFL? E-pulltab distributor says nearly 40 sites in MN are up and running, making more money than initially projected on a per-device basis. Minnesota’s Revenue Department moreover based its estimate on assumptions that may or may not hold. Among them: 1,500 sites would offer electronic bingo, and 2,500 would install pull-tab machines. At the current rate of less than 1.5 new venues/day joining getting into the electronic pull-tab gambling exploitation business, it will only take another 4.5 years to reach the levels needed to cover stadium debt obligations without tapping into the general fund. Has any venue launched electronic bingo yet? As far as I can tell, we’re 0/1,500 on collecting money from through bingo for Vikings stadium Wilfare. For every $1 that goes to support that charity, $1.80 goes to support the NFL. For every $1 that goes to support that charity, $1.45 goes to the e-pulltab vendor. For every $1 that goes to support that charity, $0.75 goes to the bar. For every $1 that goes to an actual charity, $3 goes to support for-profit companies. Call me crazy, but I think there may be more efficient ways to give money to charities than to give $3 to the NFL, an Las Vegas e-pulltabs gaming company, and a bar for every dollar that goes to charity. It’s costing you $4 to make a $1 donation. Plus, if you simply donated your own money to the charity of your choice, you could deduct the contribution. After deductions, straight up donating a dollar to charity costs less than a dollar. If donating to subsidize Zygi Wilf’s wealth is important to you, I’m sure you could send a check to Winter Park to help the guy out. Or, but a brick at the new stadium. How are those brick sales coming along? Racinos Get a Mention in the NY Times. It’s Not Pretty. The NY Times’ piece on March 24th about the “DEATH AND DISARRAY AT AMERICA’S RACETRACKS” looks at the injury and death rates of horses and jockeys across the country. 16 horses have already died at one racino this year? That article was published at the end of the 12th week of the year. I have a hunch Zygi Wilf could care less how the State of Minnesota comes up with the more half a billion in cash he’s demanding we provide to subsidize his bottom line. But, we should care. Author Ed KohlerPosted on March 25, 2012 Categories Gambling, PoliticsLeave a comment on Racinos Get a Mention in the NY Times. It’s Not Pretty. Will Electronic Pulltabs Attract a Younger Crowd or Problem Gamblers for Vikings Stadium #wilfare? One of the issues raised during the March 14th Senate Local Government and Elections Committee hearing on the Vikings stadium corporate welfare bill came from Sen. Benjamin Kruse (R-Brooklyn Park) who asked questions about what backup funding sources would the state have to rely upon if electronic pulltabs didn’t produce as much revenue as the state estimates. That’s a very fair question. 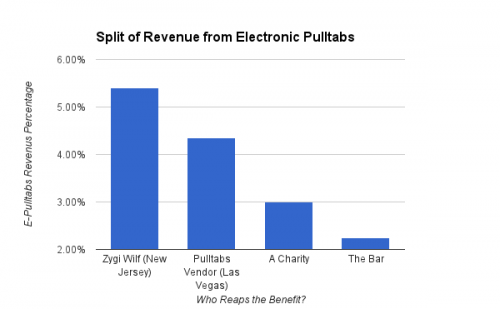 As I understand the issue, if people don’t flock to electronic pulltabs, the state would have to make up the difference by raiding the state’s general fund. As in, we would be taking money from schools, roads, and health care to make the debt payments on the stadium we built for Zygi Wilf. Which makes me wonder: why would anyone find electronic pulltabs interesting? 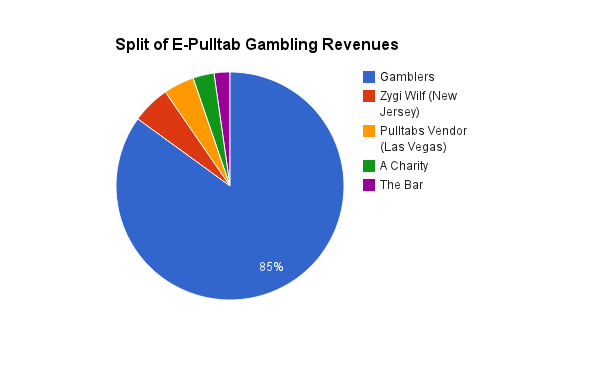 Here are the thoughts I’ve come up with and heard about electronic pulltabs in recent days. 1. Personally, I’d be LESS likely to use pulltabs in electronic form. The paper form, to me, is more social. When I open a loser, I can throw it down on the table or flick it at a friend of mine. I don’t believe I’d be able to do either of those things with an iPad style pulltab device. 2. Kids these days that are busy on their phones at bars are not likely to turn their attention to electronic pulltabs. While paper pulltabs may not seem all that cool versus the latest iPhone, it’s not the electronic nature of the device that makes it more popular than paper pulltabs. It’s what they’re doing with that device. Do you really think that paper or electronic pulltabs can compete with a 24 year old getting an alert on her phone that someone has commented on a photo she’s been tagged in on Facebook? No chance. 3. One group that may find electronic pulltabs more attractive than paper pulltabs is gambling addicts. Lets say that you just ripped through $100 of mostly losing pulltabs. In the paper pulltab world, will that gambling addict make the walk of shame to redeem their $4 in winners for another $100 in pulltabs? Or, if they are $96 in the hole while huddled up in the corner of a bar, will they keep pouring more money into the machine without human interaction? What I’m saying is that, intuitively, I don’t think electronic pulltabs will attract the crows that electronic pulltab promoters claim they can. And they may drive our state’s problem gamblers even further into the hole. All to subsidize – not a charity – but a private NFL franchise owned by a New Jersey businessman. Author Ed KohlerPosted on March 14, 2012 Categories Gambling, Politics, Vikings20 Comments on Will Electronic Pulltabs Attract a Younger Crowd or Problem Gamblers for Vikings Stadium #wilfare? Post market close on December is when the news of Senjem’s new leadership position was announced. Why is Senjem worth so much to Canterbury? He’s the MN Senate’s #1 supporter of Racino. 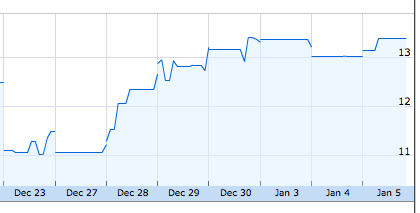 In fact, Curtis Sampson saw his shares increase in value by nearly $1 million on December 28th. But, if you’re someone who’d like to see Minnesota invest in people and companies that create products and services sold to people and companies outside the State of Minnesota – thus bringing new money into the state – rather than increasing exploitation of ourselves through increased gambling, this may not be the best news in the world. Who has the Racino Lobby Bought? We seek to eliminate all state-sponsored gambling and oppose any expansion of gambling in Minnesota. In regards to casinos already in place, current gambling laws should be changed so that Minnesota is allowed to tax profits and revenue of tribal casino gambling in the state. I think that makes it clear that the MN GOP can be bought. They’re abandoning their own party’s platform for a few hundred campaign dollars each. 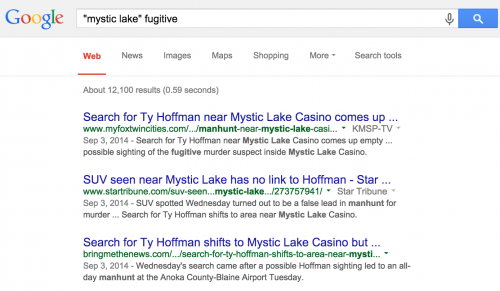 So what if the MN GOP flips on their position on gambling? Maybe exploiting gambling addicts and destroying families is justified in tough financial times? What is the justification for supporting the racino at this time? Building a new stadium for corporate welfare queen, Zygi Wilf and his private business, the Minnesota Vikings. Author Ed KohlerPosted on June 6, 2011 September 4, 2018 Categories Gambling, Politics6 Comments on Who has the Racino Lobby Bought? Here’s something I haven’t seen in Minnesota yet. State sponsorship of beer glasses for bars. 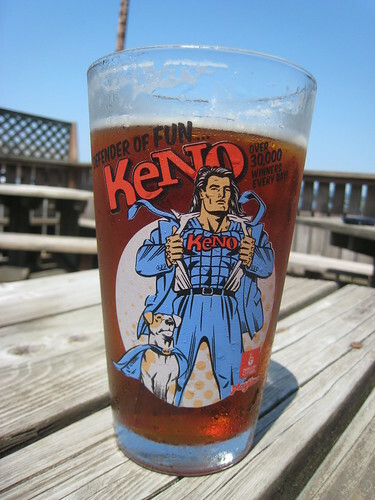 Oregon’s bars often have gambling in the form of keno or video poker. Apparently, drinking isn’t enough encouragement on its own, so the Oregon Lottery folks are giving beer glasses to bars. Will we see loons on the side of beer glasses in Minnesota soon? As regular readers of The Deets know, I’m a big fan of Hot Hot Super Jackpot. So earlier today, I decided to hop on The Google and see if anyone else shares my love for this game. First, I found out that “Super Jackpot” is two words after finding only links to my own posts for the conjugated term. Once corrected, I found this. Harrah’s publishes a “Slot Finder” search on their website where people can search by slot machine to find Harrah’s properties with their favorite game. It turns out that there are 18 locations within the Harrah’s chain stocking the game, but only 13 locations with the penny denomination. Next time I’m in Atlantic City, I’ll be sure to Baily’s or Showboat rather than Caesar’s for some Hot Hot Super Jackpot Penny Slot action.